My skin's health from the genetic level. I would very much like to thank HomeDNA for allowing me to be part of this revolutionary new approach to skin care. To get started we are all aware of the new trends towards person specific healthcare based on your own DNA. DNA, the genetic code responsible for everything from how you look (height, color of eyes, hair color-natural hair color- at what age that hair turns grey) everything. Of course DNA does have a huge role in how healthy you are (how easily you burn carbs, artery elasticity -heart disease- increased chances of cancer). Yes it is all coded in our DNA. 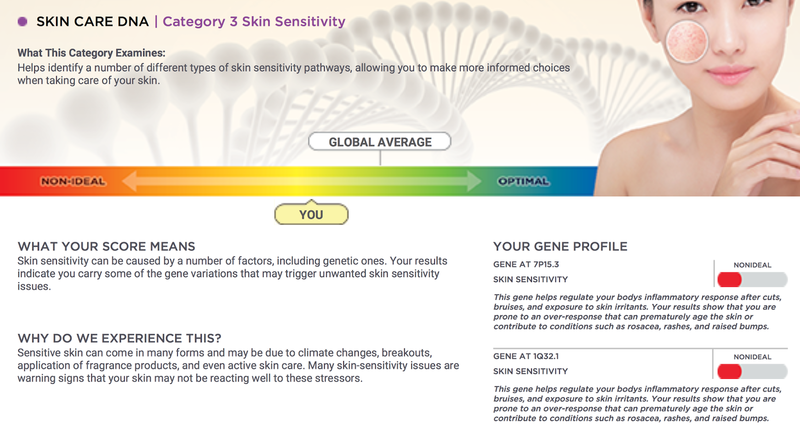 HomeDNA examined my overall skin health and how well it will age. Let science help me put my best face forward. 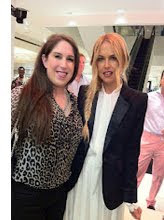 Like many, I was curious if my rituals of slathering sunblock on my face in the morning, gentle cleansers, and patting small fortunes of night rejuvenating creams on before bed really work? All of these potions whether retinol, salicylc acid, volcanic ash, algae, whatever it is the claims are the same, youthfull wrinkle free even toned skin. 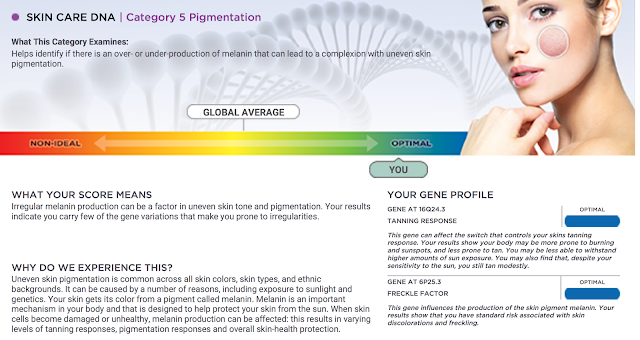 HomeDNA unlocks the secret code for your individual skin needs and makes recommendations based on those results. I was tested for 7 categories: Remember this is a test and as with any test I take, from my SAT to my driver's test I want to ace them. On this test the goal is to be optimal. Let's see how I did. 1. Fine lines and wrinkles. 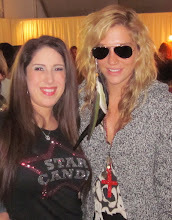 What we are looking at here is how healthy my collagen is. 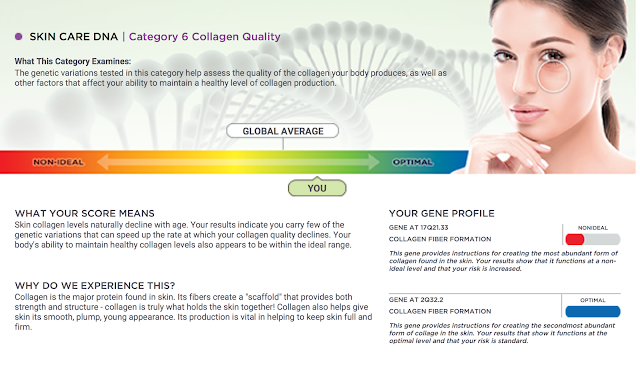 Collagen is one of the main connective tissues in the body. As far as collagen goes it connects the skin to structures under the skin. Healthy collagen means smooth skin no wrinkles. As it turns out excess sugar in the body can actually break down collagen. Being made of sugar and spice and everything nice comes with some difficulties. 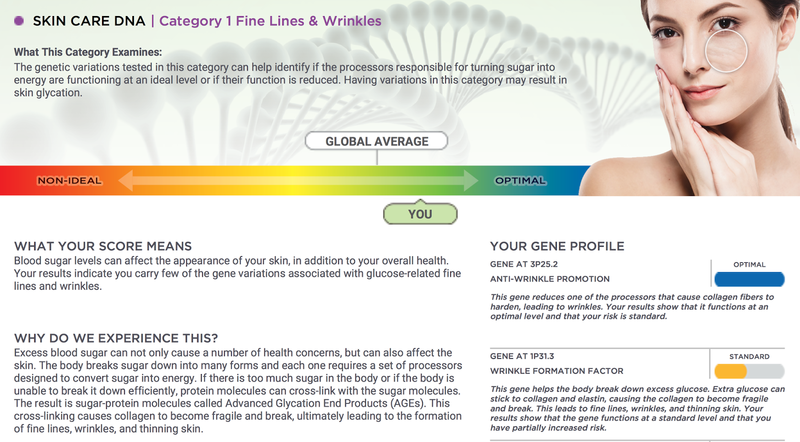 Luckily according to my test result I am stacked with the protective genes that keep sugar from hurting my collagen. GOOD NEWS I can eat dessert. 2. Sun protection. 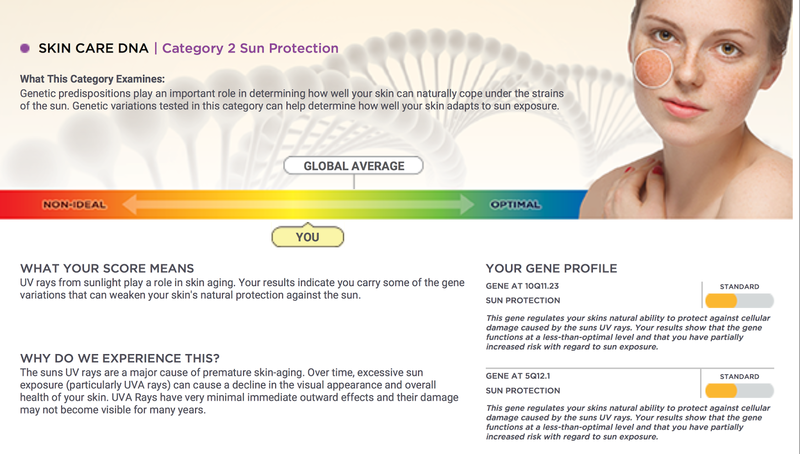 It is true UV rays damage the skin so I have been very loyal about using sunblock everyday. According to my test results not letting the sun kiss my face has helped. I am just average on my genetic protection from the sun. 3. Skin Sensitivity. This is a tricky one. Many things can cause your skin to become red and irritated. Some are as simple as hot or cold weather, others are chemical induced, added fragrances, in laundry soap can do it also. A bit too harsh of exfoliating can cause redness as well. According to my results I overreact and have a tendency to create excess inflammation which increases the aging process. It is true harsh exfoliating and many acid peels cause excessive redness for me. Makes opening the freezer and feeling that cool soothing blast of frost a real treat. 4. Skin Elasticity. Mixed in with our collagen are many small elastic fibers. These fibers give skin it's resilience and brings it back to it's healthy youthfull self. This is apparent in the smile lines, funny how they don't make people happy. On these I am an underachiever :( But luckily I have strong collagen that helps to make up for this (I hope). 5. Pigmentation. Pigmentation is the coloring of our skin. Dark patches which no one wants. What causes the dark spots is an increase in melanin. Melanin is a natural response to the sun. As mentioned before a freckle is nothing more than a long kiss from the sun. Freckles are melanin. According to my test results I have a good tanning response, but I will have a tendency to burn first. 6. 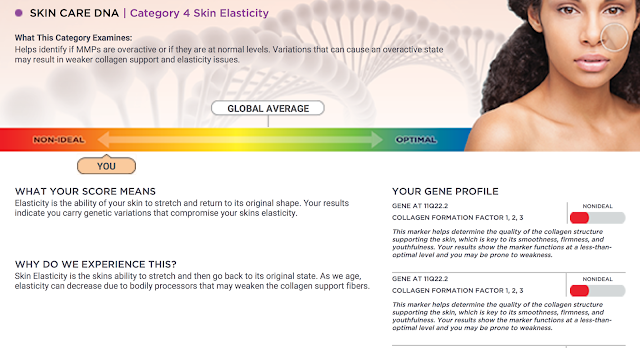 Collagen Quality. So to understand collagen it is simple. Good collagen equals less wrinkles. According to my results I do not make as much of the most common collagen in my body, but I excel at making the second most common collagen, plus I have excellent repairing of that collagen. I'm a little worried as poor collagen leads to hollowing of the eyes and that leads to the appearance of dark rings. 7. Skin Antioxidants. Antioxidants are just free radicals. What happens is free radicals damage cell walls. Enough damage to these walls and the cell dies. Cell death equals aging. Free radicals are produced naturally in our bodies, but our skin is susceptible to free radicals created from the sun and our pollution. I live in Los Angeles where smoking indoors is banned, so that blocks out some free radicals. The biggest problem is pollution from the road. Los Angeles has a very large population, poor public transportation system and constant gridlock. 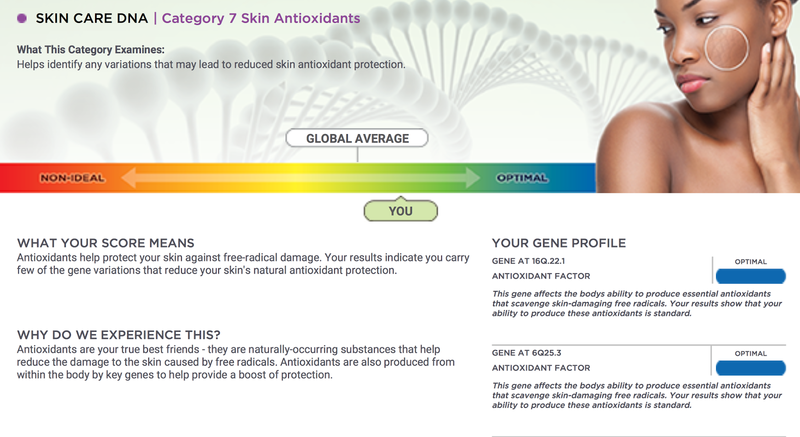 Luckily my genetic ability to scavenge up and destroy those free radicals is optimal. Of course, this does not mean I am going to spend hours on the freeway with my top down and let myself be bombarded by pollutants. Under each category HomeDNA gives suggestions on what ingredients to look for in topical treatments, the right vitamins and nutrients to look for in supplements, and suggestions for professional treatments. With my new found information I am much better armed and prepared to not age and stay looking as young and healthy as possible for as long as possible. 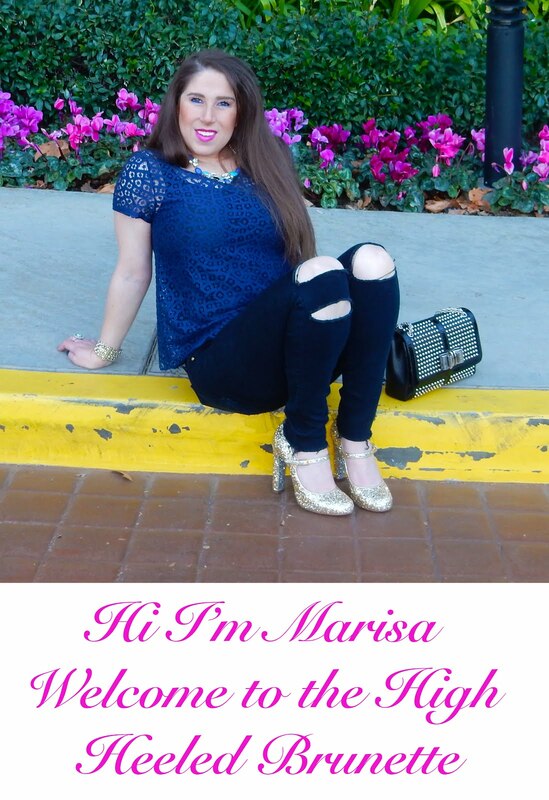 Thank you so much for reading my post! I hope you enjoyed it. If you would like to purchase this kit you can find it at CVS.